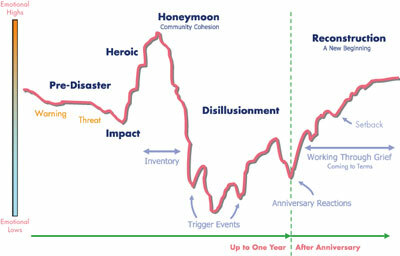 This graph shows the emotional highs and lows survivors typically experience before and after a disaster. After any disaster, experts say emotional connection is key to long-term mental health. California HOPE is a mental health program in Sonoma County, California providing just that. Offering free counseling and support services to victims of the 2017 North Bay wildfires, California HOPE has been instrumental in helping residents overcome trauma and loss. The program connects survivors with support services and helps them understand their options so they can move forward with their lives. Below is a list California HOPE put together to help people develop emotional resilience as they begin the process of recovery. Accept help and support from those who care about you and listen. Accept that change is part of living. Accepting what can’t change helps you focus on what can be. Nurture a positive view of yourself and your ability to solve problems. Act on problems rather than detach and wish they would go away. Try visualizing what you want, rather than worrying about what you fear. Find purpose in your healing and service to others. Avoid seeing crises as insurmountable problems. Look for opportunities to learn about yourself. How have you grown as a result of your struggles? Pay attention to your own needs and feelings. Engage in activities that you enjoy and find relaxing. Focus on the important things in your life. Cultivate moments of gratitude daily. California HOPE is funded by the Federal Emergency Management Agency (FEMA). Ask FEMA or your local government relief agency if there's a California HOPE in your county. The School of Public Health at the University of Washington is hiring!